It must be the day for FREE product coupons! Here’s another for a FREE 64-oz. Old Orchard Juice! Cash in on a FREE 64 oz bottle of Old Orchard coupon! 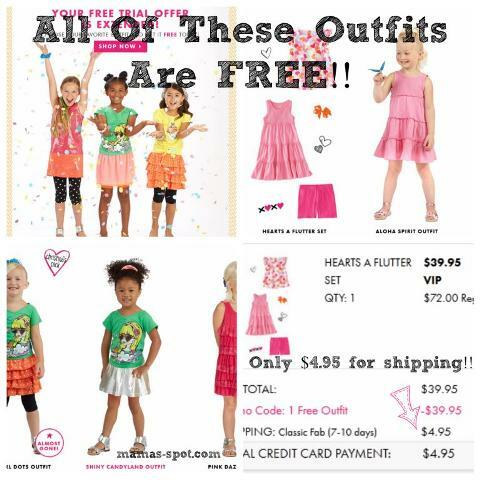 *Act Quick - Last Day* FREE 3 Piece FabKids Outfit!!! Hurry!! (Reg. $39.95!!) I got One!! Update: Last Day To Get This!! Wow!!!! This awesome deal just got sweeter!! Now you can snag a FREE outfit from FabKids!! :: Hurry over here to Fabkids and sign up. :: Find an outfit that you like and pick it. I love this outfit!! I was so impressed with the quality too! She now has a pretty unique outfit that is just for her! If you haven't yet, I would suggest just heading over and at least checking it out. FabKids is a new site that you can customize for your daughter — anywhere from the age of TWO to size 8, you can customize a perfect outfit for your child’s style. Even if you don’t buy one — it is a fun little personalization! Head over to FabKids and check it out!! They have VERY fast shipping and it’s FREE too! All outfits ship free and are backed by the Pinky Promise – 100% satisfaction guarantee. FabKids is geared towards busy parents looking to save time on shopping for kid’s clothes.